It’s clear that the U.S. economy is heavily concentrated in certain locations (the Northeast, California, Chicago) and less in others (the Heartland and Mountain regions), but what is the precise distribution? How much of the U.S. GDP comes from large cities versus rural areas? And how do the economies of each city compare with each other? The distorted map below, known as a cartogram, is one way of approaching the question. This map displays every county in the U.S. Each county is sized proportional to its share of the total U.S. GDP. 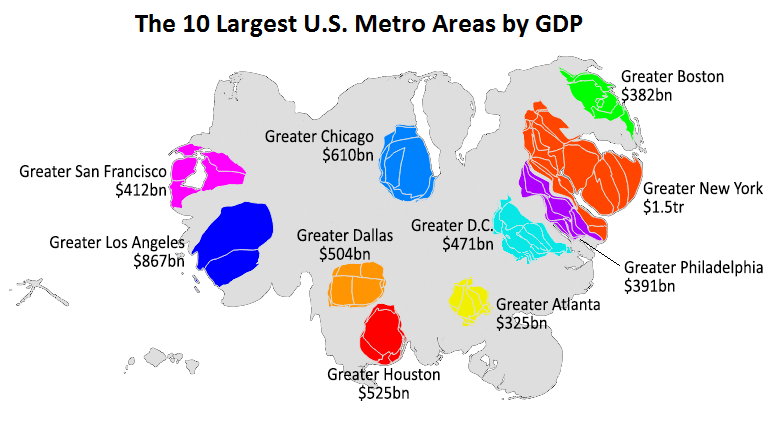 This map below highlights each of the 10 largest metro areas, along with its GDP. To add some context to these numbers, Greater New York’s GDP of $1.5 trillion is larger than all but 11 countries. If it were its own country, Greater New York’s economy would rank just above Australia and South Korea and just below Canada and Russia. At the low end of this group, Greater Atlanta’s GDP of $325 billion is enough to rank it #36 on the list of countries, immediately below Denmark and Malaysia and above Singapore and Israel. The last time I made a cartogram of the U.S., a number of people thought it would be interesting to see the same for the U.K., considering how much of its economy is concentrated in a single city, London. So, for comparison, here is another cartogram showing how U.K.’s economy is distributed. To see a cartogram breaking down the world economy by country, see: How We Share the World. All figures are quoted in nominal 2014 GDP. The BEA publishes GDP for metro areas, but not for counties. To reach these estimates, I first calculated each county’s share of U.S. aggregate household income. Then I grouped the counties together by metro area, and scaled them so that the sum of each metro area matched the BEA’s figures. This makes me wonder about the distribution of farm land to industrial vs. independent owners. Agriculture makes up 5% of US GDP, but it is spread out over such a large area that it ends up the same color in the heat map as inarable land. I wonder if the owners of the majority of agriculture are reporting their income in a metropolitan area, and that is skewing the value of farmland low. The dark blue covers a pretty big range of values, which I expect would include all farm land, whether or not the income is reported there. Though I think you are correct. Many of those farms are owned by large companies, and I believe their contribution would count wherever the company pays taxes — not where the farms are. You should do two separate maps instead of the animated gifs- I really like to examine the maps closely by county and the animation is really distracting. A key would be nice. What do the colors mean?